Throughout the history of Western Civilization, libraries have been the repositories of nations’ accumulated knowledge and the epicenters of their culture. Central libraries, more than being big buildings containing books, are important landmarks designed with impressive architecture and filled with symbolic art. The Los Angeles Central Library is certainly no exception. An in-depth look at the art found at the Library is quite a revealing one: It describes the occult philosophy of those in power. 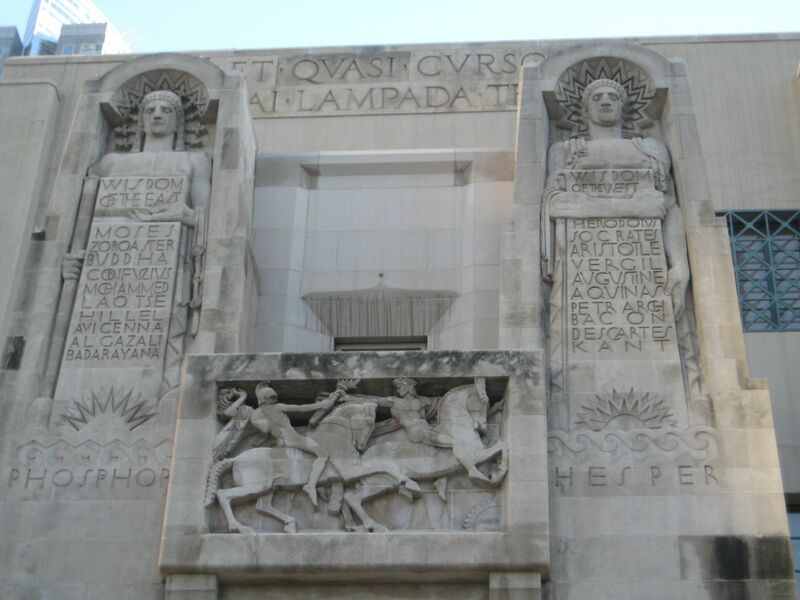 We will look at the Central Library’s history and the hidden meaning of its architecture. 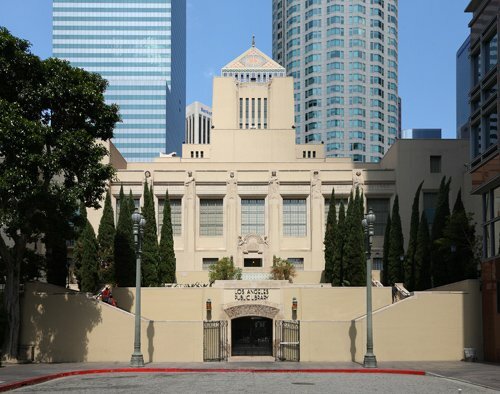 Built in 1926, the Central Library is an important landmark of downtown Los Angeles. 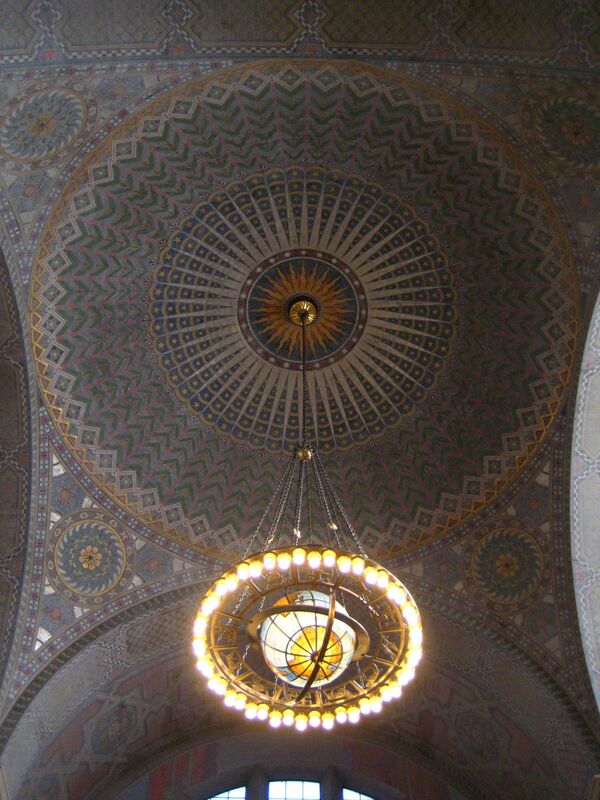 It is the central piece of one of the largest publicly funded library systems in the world, the Los Angeles Public Library (LAPL). Most touristic pamphlets describe the building’s design to be inspired by ancient Egyptian and Mediterranean Revival architecture. As we will see, this choice of design is not simply an aesthetic one, it rather recalls the teachings and the symbolism of the ancient mystery schools of Antiquity. In fact, after decoding the library’s many esoteric features, we can safely say that the building is mainly inspired by Freemasonry, which is, in turn, heavily steeped in ancient Egyptian and Mediterranean mysteries. 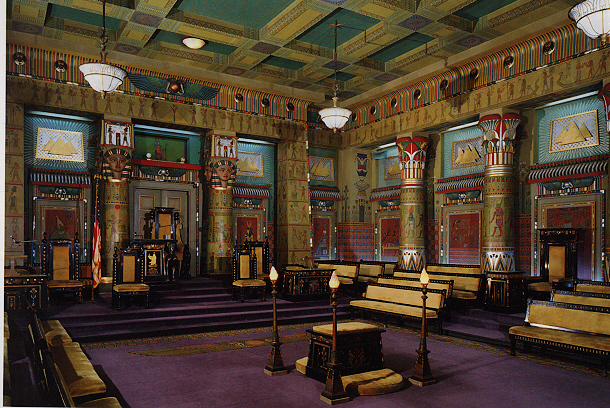 The Egyptian Room of a Masonic Lodge attests to the great importance of Egyptian mysteries in Masonic lore. The Library’s tiled pyramid, two sphinxes, celestial mosaics and other details turn this public space into a true occult temple. Furthermore, the library is definitely built with an elitist state of mind. The true meaning of the art on display seems to be solely intended for initiates of secret societies and not the masses. Before we examine the building’s most important features, let’s look at the background of its builders. Bertram Grosvenor Goodhue, architect of numerous buildings of power. One of the most recognized elite buildings designed by Goodhue is the headquarters of the Wolf’s Head Society – a secret society of Yale University. Along with the notorious Skull & Bones and Scroll & Key – the two other secret societies found at Yale – Wolf’s Head functions are quite similar to Freemasonry: It is a discreet yet major force influencing one of America’s most elite universities. It has held within its ranks members who went on to become prominent politicians, diplomats, lawyers, and athletes. 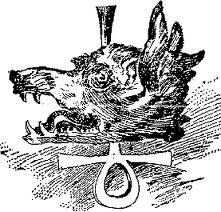 The insignia of Yale’s Wolf Head Society. 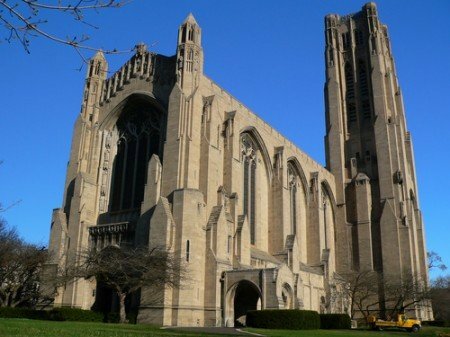 Perhaps Goodhue’s most notable project is the Rockefeller Memorial Chapel of the University of Chicago. Commissioned by America’s most powerful tycoon, John D. Rockefeller, the ecumenical Chapel is used for various religious celebrations. 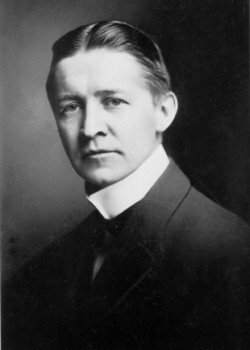 Rockefeller stated that the Chapel was meant to be the campus’ “central and dominant feature”. The Chapel was designed in collaboration with Lee Lawrie, America’s foremost architectural sculptor. The duo worked on several other important projects such as Nebraska’s State Capitol and the Los Angeles Central Library, the subject of this article. 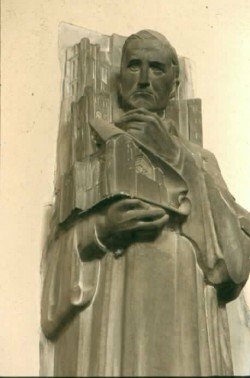 Sculpture of Bertram Goodhue holding the Rockefeller Chapel by the Rockefeller’s favorite sculptor, Lee Lawrie. 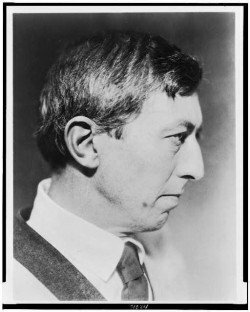 Born in Germany in 1877, Lawrie came to the United States at the age of 5. After learning the craft from some of America’s leading artists, Lawrie collaborated with Goodhue on several projects and became America’s leading sculptor. His unique style and his knowledge of occult symbolism, ancient mysteries, and Masonic principles apparently made him the elite’s artist. 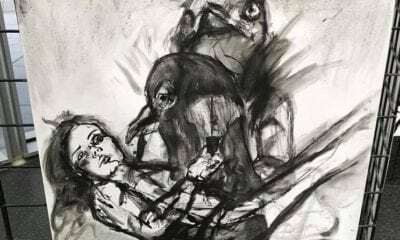 Some of his high-profile commissions include the allegorical relief panels of the United States Senate, the Louisiana State Capitol, the statue of George Washington at the National Cathedral in Washington D.C and the Harkness Tower of Yale University. 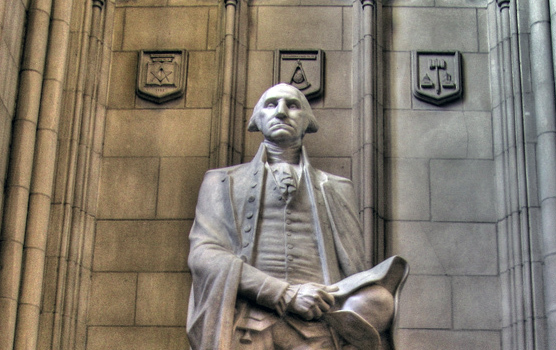 Lawrie’s statue of George Washington at the National Cathedral. Notice the Masonic Square and Compass behind him. Lawrie’s most recognizable works are however displayed at the Rockefeller Center. Lawrie’s Wisdom, above the main entrance of 5, Rockefeller Center, NY. The sculpture depicts a gnostic demi-urge holding a Masonic compass. 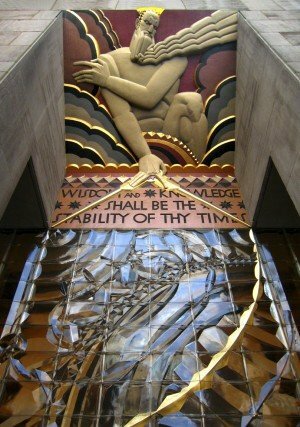 As described in a previous Vigilant Citizen article entitled Sinister Sites: Rockefeller Center, the complex built by John D. Rockefeller is filled with symbolic art describing the elite’s Luciferian philosophy based on the acquisition of divine knowledge (more on this later). 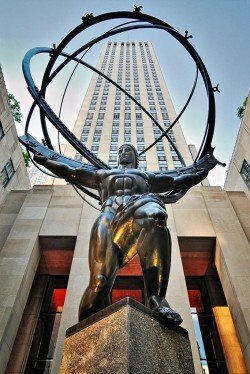 Another important piece conceived by Lawrie at the Rockefeller Center is the statue of Atlas. Lee Lawrie’s Atlas at Rockefeller Center. Atlas is used by the ruling class as a metaphor “for the people who produce the most in society”, and therefore “holding up the world” in a metaphorical sense. 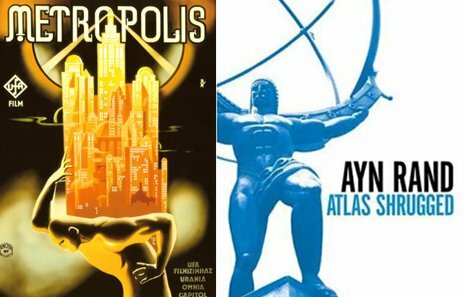 Not surprisingly, Atlas is associated with some of the most important works of fictions describing the point of view of the elite. Fritz Lang’s Metropolis and Ayn Rand’s Atlas Shrugged: two classic works of fiction describing the vision of the world’s occult elite. Both work’s promotional material feature Atlas, a metaphor for the elite “upholding the world”. Knowing that Goodhue and Lawrie produced symbolic architecture for America’s most prominent tycoons, politicians, and institutions, would you be surprised if the Central Library contained the same? The library was originally built in 1926 by Bertram Goodhue. According to the Library’s documentation, the architecture’s central theme revolved around “illumination through the light of learning”. Due to an arson fire in 1986, the building underwent extensive renovations and expansion – but the central theme was faithfully respected. The artwork’s spiritual and esoteric undertones make the entire complex a “temple of illumination”. It is replete with profound mystical symbolism, sacred geometry, proportions, and allusions to important occult works. The Los Angeles Central Library and the Rockefeller Center are very similar in this regard – not surprising, as Lee Lawrie masterminded both complexes. As it is the case for the Rockefeller Center, the torch of Illumination, representing divine knowledge, is the most important symbol of the Library. Sitting at the top of the Library is probably the complex’ most distinctive feature: A tiled pyramid topped by a golden hand holding a torch. Other than being beautiful and decorative, the Library’s apex has a deep occult meaning, clearly inspired by Freemasonry. First, in occult lore, the pyramid is considered to be the ultimate symbol of the Mysteries. It represents the transition from the material plane to the spiritual world. From the square-shaped base of the pyramid (representing the material world) rise, in mathematical perfection, four triangles (representing divinity). According to many occult researchers, the pyramids of Ancient Egypt were most likely used for the purposes of initiation, where candidates were led to the path of Illumination. On each side of the pyramid is a sun symbol, the most visual ancient representation of deity. Although the sun (or sunburst) is the most common occult symbol to represent the divine, it is however not directly worshiped as a god. It is a visual representation of the divinity. For this reason, the Central Library is replete with references to the sun. In all the histories of the Gods and Heroes lay couched and hidden astronomical details and the history of the operations of visible Nature; and those in their turn were also symbols of higher and profounder truths. None but rude uncultivated intellects could long consider the Sun and Stars and the Powers of Nature as Divine, or as fit objects of Human Worship; and they will consider them so while the world lasts ; and ever remain ignorant of the great Spiritual Truths of which these are the hieroglyphics and expressions. Above the pyramid is golden hand holding a torch. There is a reason why this symbol is sitting above all others in the building: It is a perfect representation of the building’s philosophy, Luciferianism. 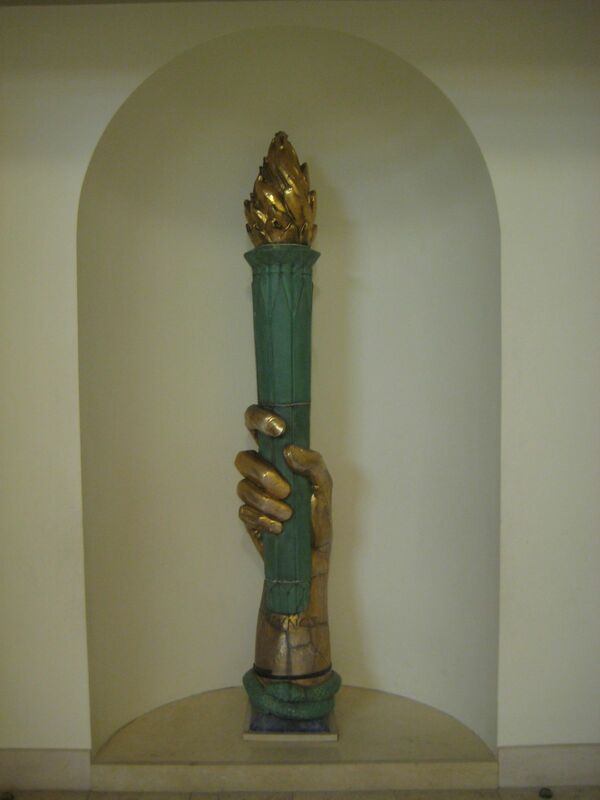 The original torch is on display inside the Library. There, we can see more of the torch’s detail, including the serpent of knowledge intertwining its base. In Latin, the word “Lucifer” means “light bearer”. In occult symbolism, light and fire esoterically represent divine knowledge and enlightenment. A hand holding a lit torch, therefore, represents man’s ascent to divinity through the teachings of the Mysteries. The Gnostic interpretation of the story of the Genesis considers the snake (Lucifer) as a positive figure. It has given humans the intellectual faculties to reason and to ascend to divinity by their own means. “opportunity to erase the curse of mortality by direct encounter with the patron deity, or in many instances by actually undergoing an apotheosis, a transfiguration of human into divine”. 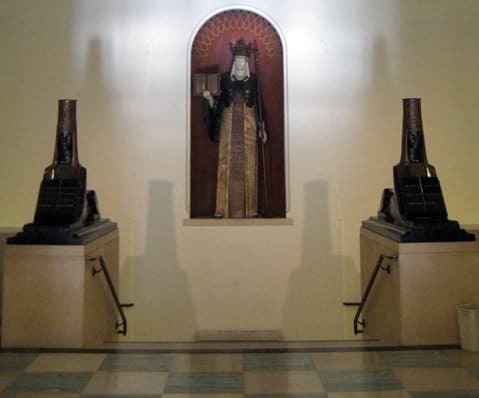 Masonic authors such as Albert Pike and Albert G. Mackey have referred to the “Luciferian path” and the “energies of Lucifer” to describe the “search for light”. The term “Luciferian” is therefore used in the scholarly sense of “bringing enlightenment”. Masonic scholars often invoke Prometheus, who stole fire from the gods to bring to man, to describe this concept. For this reason, Prometheus is the central figure of the Rockefeller Center. 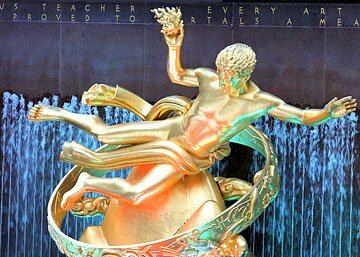 Prometheus, the Hellenic equivalent of Lucifer, bringing divine knowledge to humanity at Rockefeller Center. The references to Lucifer in this library do not stop here. Conceived by Lee Lawrie, the Western facade of the Library is another nod to the Mystery schools. Two human figures are depicted with the names “Phosphor” and “Hesper” underneath them. This apparently minor detail is perhaps the most significant. Phosphor (or phosphorus) is the Latin word for the planet Venus in the morning, also referred to as the “Morning Star” or the “bringer of light”. Those terms are synonymous with Lucifer. “Believing Venus to be two bodies, the Ancient Greeks called the morning star Φωσφόρος, Phosphoros(Latinized Phosphorus), the “Bringer of Light” or Ἐωσφόρος, Eosphoros (Latinized Eosphorus), the “Bringer of Dawn”. The evening star they called Hesperos (Latinized Hesperus) (Ἓσπερος, the “star of the evening”). By Hellenistic times, the ancient Hesperos would be translated into Latin as Vesper and Phosphoros as Lucifer (“Light Bearer”), a poetic term later used to refer to the fallen angel cast out of heaven. Hesper (or Vesperus) refers to Venus in the evening, the evening star. “The disciples of Pythagoras also highly revered the planet Venus, because it was the only planet bright enough to cast a shadow. As the morning star, Venus is visible before sunrise, and as the evening star it shines forth immediately after sunset. Because of these qualities, a number of names have been given to it by the ancients. Being visible in the sky at sunset, it was called vesper, and as it arose before the sun, it was called the false light, the star of the morning, or Lucifer, which means the light-bearer”. So Phosphor and Hesper are two words signifying the same entity, Venus, a celestial body occultly associated with Lucifer, at different stages of evolution. 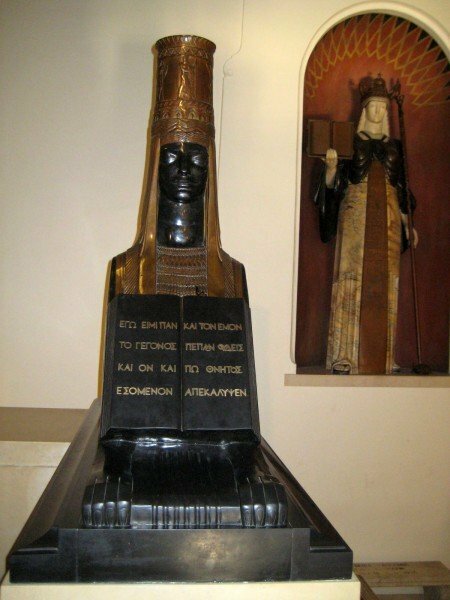 The figure representing Phosphor holds the names of Eastern philosophers such as Moses, Zoroaster, and Buddha, while Hesper holds the name of Western thinkers such as Socrates, Francis Bacon and Immanuel Kant. These historical figures have not been chosen at random: they all play important roles in the teachings of the Mystery Schools. In fact, Francis Bacon, René Descartes, and Immanuel Kant are central figures of the revival of modern Rosicrucianism and Freemasonry in Western civilization. At the top of the wall is the Latin saying “et quasi cursores vitai lampada tradunt”. This is a quote from the Roman poem De Rerum Natura (On the Nature of the Universe) written by Lucretius and can be translated to “And like runners they pass on the torch of life“. The “torch of life” can be equated to the occult Mysteries, the hidden knowledge passed down from generation to generation through secret societies. 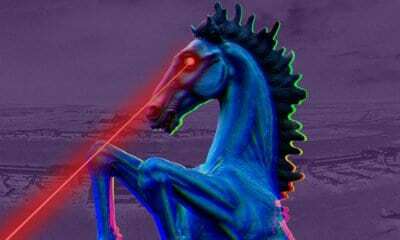 Between Phosphor and Hesper, we see a cavalier passing the “torch of life”, or occult knowledge, to the next generation and from the East to the West. The western facade of the Library, which also serves as the main entrance, is, therefore, a very significant piece representing the enduring existence of mystery schools through Luciferian philosophy. All of this, and we haven’t even stepped inside the building. Situated right under the pyramid on the top of the building, this globe chandelier is composed of cast bronze and, according to the Library’s documentation, weighs one ton. It was designed by Goodhue associates and modeled by Lee Lawrie. The globe is surrounded by a ring containing the signs of the zodiac and is illuminated by 48 lights. 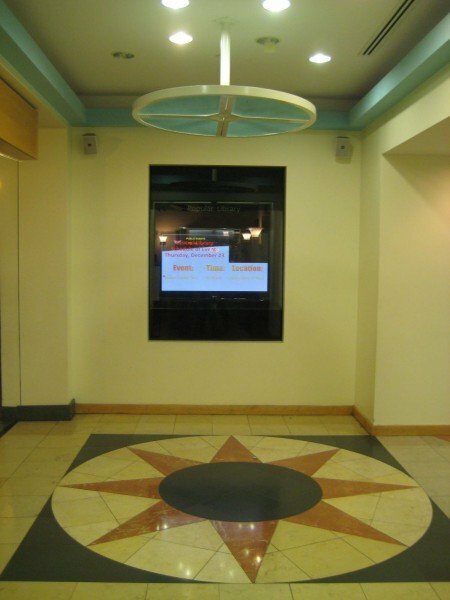 The ring is attached to chains leading to the sunburst on the ceiling. As seen earlier, the sunburst is an ancient symbol representing divinity. This design is reminiscent of qabbalistic engravings representing the 72 names of God. 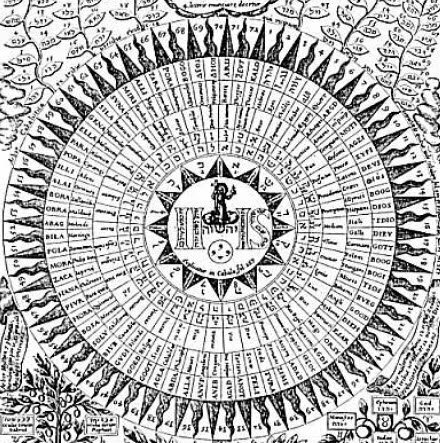 The seventy-two names of God from Kircher’s OEdipus Ægyptiacus. Like the library’s globe chandelier, this qabbalistic engraving bears the symbols of the planets and the signs of the zodiac. Do the lights surrounding the globe represent the “circle of the illuminated”, the hidden rulers of the earth, who are connected to divinity through Gnosis? Do the 48 lights, mirroring the 48 sunrays, represent the hermetic axiom “As Above, so Below”? On the statue is a carved panel containing symbols of ancient and modern civilizations. Once again, these civilizations were chosen for their importance in Masonic history as they are known to have passed down occult mysteries. 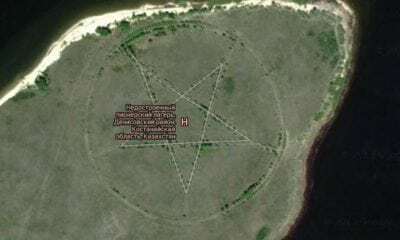 The blank space at the bottom-most probably refers to Atlantis, the lost civilization, which, according to occult texts, was at the origin of Hermetism. The building representing Medieval Christian Europe, Notre Dame de Paris, was built by the Knight Templars, the order considered to be the ancestors of modern Freemasons. The first quote is incredibly significant in Masonic mysteries as Illumination is metaphorically equated to the “lifting of the veil of Isis”. For this reason, Freemasons dub themselves the “Widow’s Sons”, the widow being Isis, the goddess who lost her husband Osiris. The second quote sums up the entire purpose of occult secret societies: to seek godliness through the knowledge of the Mysteries. The symbolism of these sculptures is therefore extremely powerful and revealing: Civilization, the force behind nations, politics, culture, economics, and citizenship is guarded by the symbol of the Mysteries. The statue basically says: Secret societies have guided the evolution of civilization since ancient times and will continue to do so. Embedded in the floor, at a central point of the Library, is an eight-pointed star, a symbol known as the star of Ishtar. 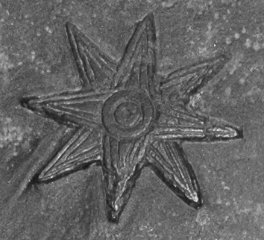 A version of the ancient Mesopotamian eight-pointed star symbol of the goddess Ishtar (Inana/Inanna), representing the planet Venus as morning or evening star. Ishtar is the Assyrian and Babylonian goddess of fertility, love, war, and sexuality and is considered by the Babylonians to be “the divine personification of the planet Venus. The story of her descent into the underworld in search presumably for the sacred elixir which alone could restore Tammuz to life is the key to the ritual of her Mysteries. 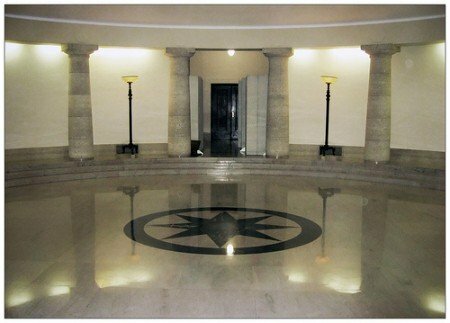 Perhaps for this reason, the symbol of the star of Ishtar is often found in the lower levels of occult buildings, such as the Manitoba Legislative building. Does this symbol represent the underworld? To most people, the Los Angeles Public Library is nothing more than a functional building, which happens to be beautifully ornamented. When one understands the occult symbolism displayed around the complex, the Library turns into a temple of illumination, dedicated to occult mysteries and Masonic principles. It is a celebration of the accomplishments of the Luciferian elite and of the prevailing of its occult philosophy. 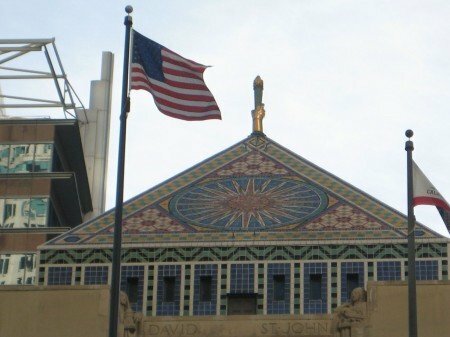 The fact that the library is dedicated to secret societies, despite the fact that the LAPL is publicly funded, tells volumes about the true nature of America’s power. 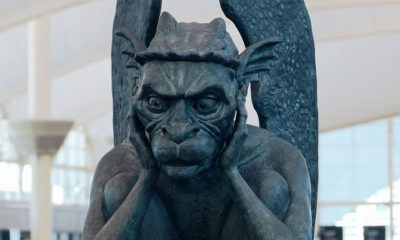 After reading this article, some might ask: “If seeking knowledge is a Luciferian trait, and if Lucifer is traditionally associated with evil, does it mean that seeking knowledge is wrong?”. Heck no. Seeking knowledge will never be wrong and being ignorant will never be right. Knowledge leads to wisdom and discernment while ignorance leads to confusion and bewilderment. Furthermore, it is only by fully understanding the forces at work in the world that one becomes in a position to truly accomplish good in society. Conversely, an ignorant person can easily be manipulated by deceivers to become their unknowing accomplices. No matter what term is used to describe the search for Truth, it will always be the noblest of deeds, regardless of one’s creed or religion. The faculties of learning and understanding are not the exclusivity of one group of people. They are gifts endowed to all humans and it is our duty to make the most of them. The most important thing to consider is this: Do you use knowledge to guide, inspire and enlighten or do you use it to control, manipulate and deceive? We have seen in previous articles how the elite uses their knowledge to manipulate the masses. What will you do with yours? It is a bit hypocritical for a group of people to designate themselves as the "elite" and feel they are the protectors of the "light" and then want to keep it secret. It is more likely that they want to protect their elitism. just a interesting tid bit, i've worked about 3 blocks away from both buildings for almost 15 years, pretty much attached to the public library is a building called "the California club". the California club has always had a reputation for hosting the social elite and the powerful. built about 4-5 years after the library. In my nearly 700 crude blogs and nearly 900 short YouTubes I have made the same verifiable allegations as you have . I have received numerous threats for exposing America’s blatant Kabbalist foundation and continuing deception through all secular adult and children’s television programming , but more particularly via the occult based Trinity Broadcasting Network’s deception . Kabbalism’s occult signals clearly and purposely given , particularly by world renown preachers such as Billy Graham are ; the middle finger , both third digits simultaneously placed to each deceiver’s temple suggesting Kabbalist Masonry’s need to facilitate Talmudically controlled Israel’s building of a third temple , witchcraft’s god and goddess sign , the witches’ pyramid , ( Billy Graham’s favorite ) , the devil hand , Billy Graham’s ” The Mummy’s Ghost ” , and several others . I appreciate the great exposure regarding this article . Great work of great depth . Thanks for your work . John Smith . Please provide the link to your youtube account. I would LOVE to check your work out! That " ishtar " star also has a black sun at the center, I assume you know about black sun worship/ nazis, etc………just sayin. Rockstar's LA NOIRE hiighlights this building in the opening sequences of the videogame, and is an important expose rife with symbolism, if you play the game, dealing the with the underside of L.A. and hollywood (everything from satanic killings, to stars getting knocked off, to the illegal drug trade supported or supplied by the u.s government). We are wise, yet we're ignorant. We are wealthy, yet we're poor. We are healthy, yet we're ill. We all know each other, yet few of us know it. We are the ocean. Each one of us are cups of ocean. Some cups picked up some sand, some seashells, some fish, some a variation of the three, and on and on. And each cup, with it's unique qualities, has something great to offer the world. We are many cups of ocean, but we all come from the same source. The ocean. When the ocean water is poured into cups, the water takes the form of the cup. But it's still the ocean. No two cups are the same, yet they are the same. They just don't know it yet, because when they were poured into the cups they were separated. They took on a new form, the form of the cup and because the cup held the water – the individual cups of water didn't recognize each other. They cups also didn't recognize where they came from. The ocean. Out of one there are many. And the many are one. Amazingly written. 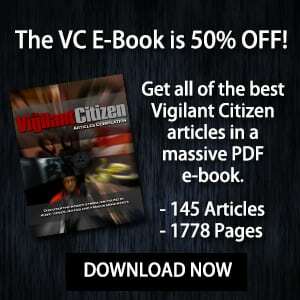 I sincerely want to say thank you for this article and website. Im from tChicago. The library here has some crazy s--t too. There are about 6-8 Large owls going around the top of the building. it is also right across the street from the Rothschild Buiulding and a 40 scalpture of an Eye Ball. Very strange intersection. It really is one of the most beautiful buildings in Downtown Los Angeles..
certain knowledge. It reminds me of the movies IN THE NAME OF THE ROSE & RAIDERS OF THE LOST ARC. 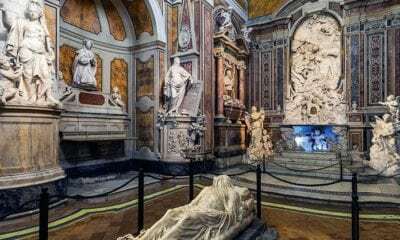 There are places that hide knowledge for a select elite few like in the Vatican. It's a fine building, that's all. The illuminati worship the Grand "I AM" which is the pantheistic oneness. These articles are either very good in that they inform people of the truth or they are very dangerous in that they lure people into searching too deeply like moths attracted to a flame. 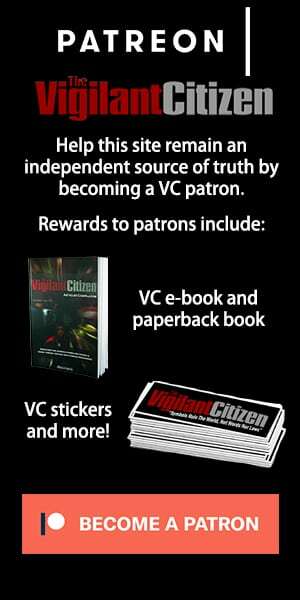 I wonder why VC doesn`t write an article on his opinion of what liberation is. Mine is that Jesus Christ is Lord and Saviour and his gift is Holy Spirit which is the spirit of Love and Life as apposed to the illuminati spirit of hate and death. GOD wants us to have faith in him. The Illuminati want to know GODs truth without needing to have faith in GOD. They believe in worship of the self. Will power which they call the Force. Because the Ideas in which you believe in came from that poem not your bible. I challenge you to find me wrong on this. Its hard to fight what you have been told for years. You would think by reading this website more people would take the time to read the book that Vigilant quotes. If you did, It would give you the real history and you may find that which you fear is really not what you thought it was. Satan an Lucifer are one in the same. Lucifer is the fallen angel Satan and these quotes are from the King James Version. Hope this clears things up for you. @ Amazed…you proved nothing by quoting those 2 verses. Lucifer is an Idea or concept. Satan is the magical evil creature in which you believe in. I am really not confused on Lucifer and Satan being as one. I am just noticing how people speak of them as two entities. Someone stated that my idea came from a poem and not the Bible. What poem? That would be the Poem entitled "Paradise Lost" my friend. They believe Typhon is Satan. Osiris' body was cut into many pieces and scattered across the world. One piece they never found was his p---s. Hence the phallic worship. Their "God" is a mix between Yahweh (God), Osiris (both the constellation AND Osiris, Isis and Horus, their son, with the all-seing eye of the illuminated through evil pineal gland) and Baal ('satan in the belly' or intestinal parasites). The real power in a freemason's life is that of his hands, which are able to give him the erection he so fervently worships. Given enough money stolen from a willing populace, masons will design and erect the phallic and fantasmagorical structures we see in these cities AND dedicate the buildings to themselves (see the cornerstone). 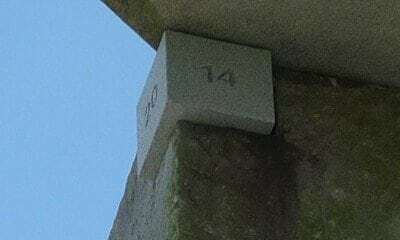 Because so much pornographic imagination is invested in the erected structure, it is likely to be maintained for many years, leading us to question 'the occult symbology herein'. Kind of like 'every day Cialis' or high-dose Viagra for the flaccid, burnt-out lodge. When you stated that the librarian/media specialist was pretty hot, did you mean angry? You should have picked her brain for the reason she lead you to the other books. She probably does know something and yearning to share it. It never hurts to just look in to things.